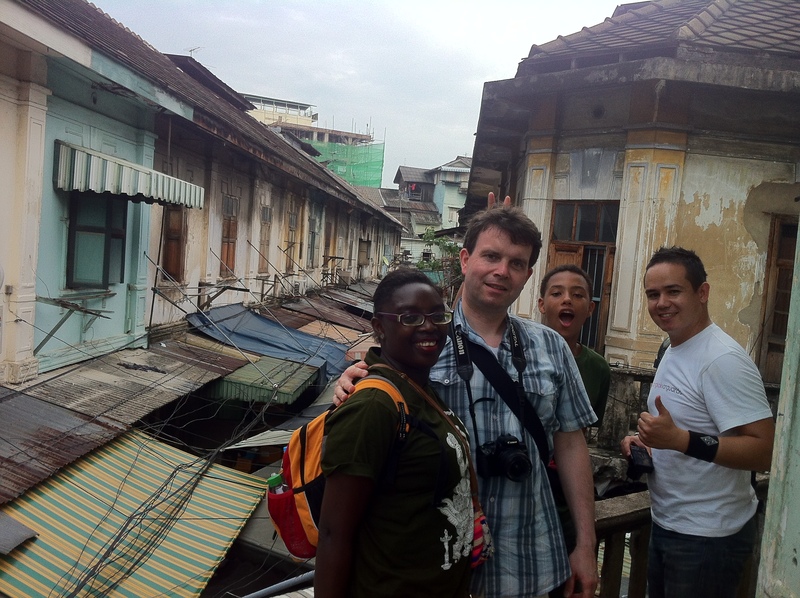 3 days in Bangkok: A walking tour isn’t what you think! Don’t look if you’re squeamish. These pig heads are real. In Bangkok, Thailand. Exactly a week ago, we returned from our one month trip in Asia. One of the first places we went to was Thailand and to be honest, there’s no point in going to Thailand if you don’t spend at least a day or two in Bangkok. As I told you at the beginning of the week, our holiday was independently organised by myself and that included where we were going to stay and what we were going to do. The front of pretty Lamphu Tree House Boutique Hotel in Bangkok. 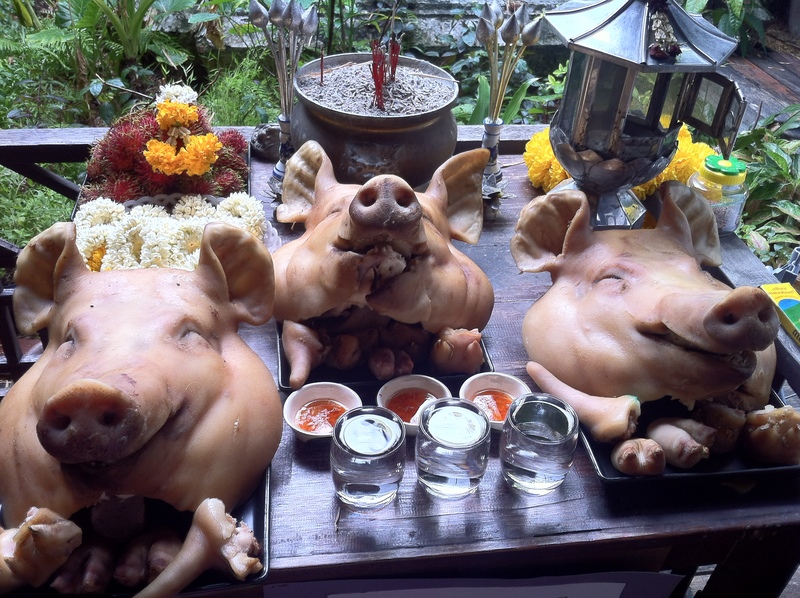 I decided to reserve a boutique hotel in the suburbs of Bangkok. I’m sorry, but this being Bangkok, I wanted to ensure that we would be in a “family-friendly” hotel as much as possible. As some of you might be aware, Bangkok has an unfortunate reputation of being slightly seedy and indeed, I did note one of the like, but only one. 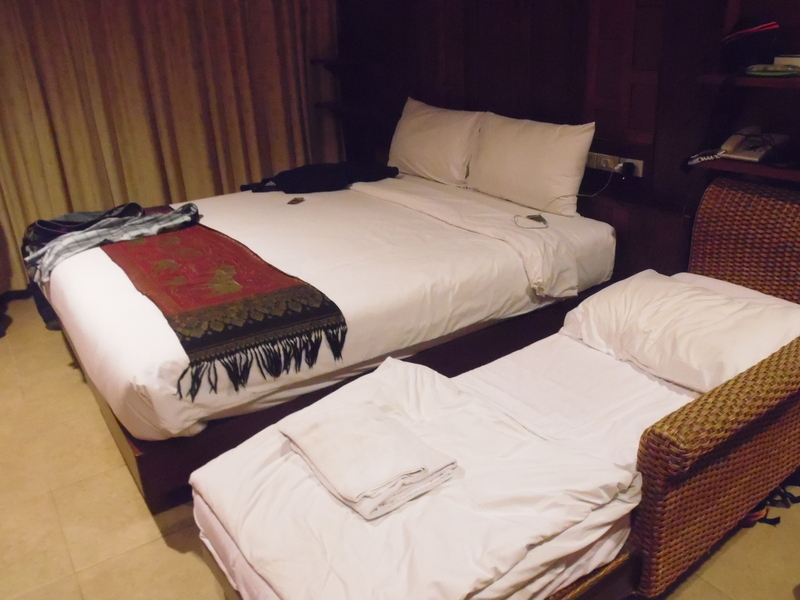 In that wise, we went to the Lamphu Tree House Boutique Hotel which is situated near the river district of Phranakom. Our superior room which included a divan, perfect for a young family or a few friends. In Bangkok! 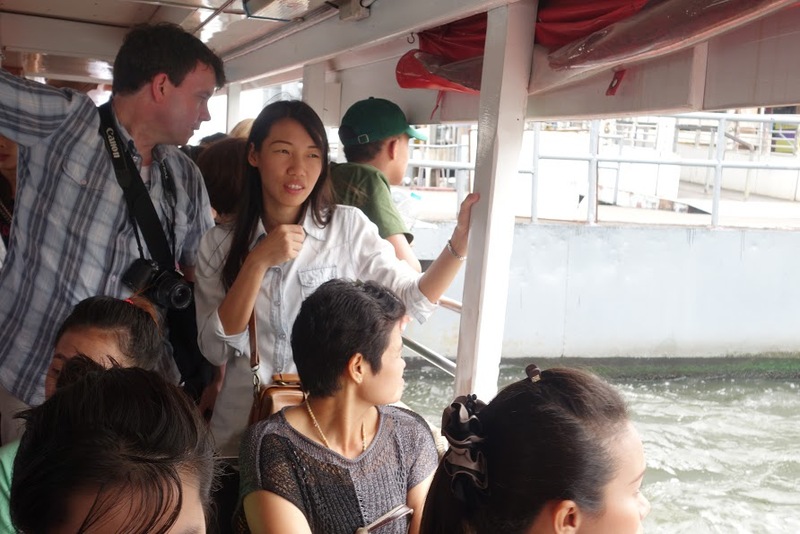 The hotel was 30 minutes from the bridge and bordered the Chao Phraya river. I was enormously pleased with the quality and standard of our hotel as I requested a superior room in the original building. It had a double bed, a divan, a private bathroom with running water, a private balcony and AC, as well as a breakfast buffet. The hotel also had quite a charming swimming pool and was enormously clean, and decorated with Thai paintings and antiques. 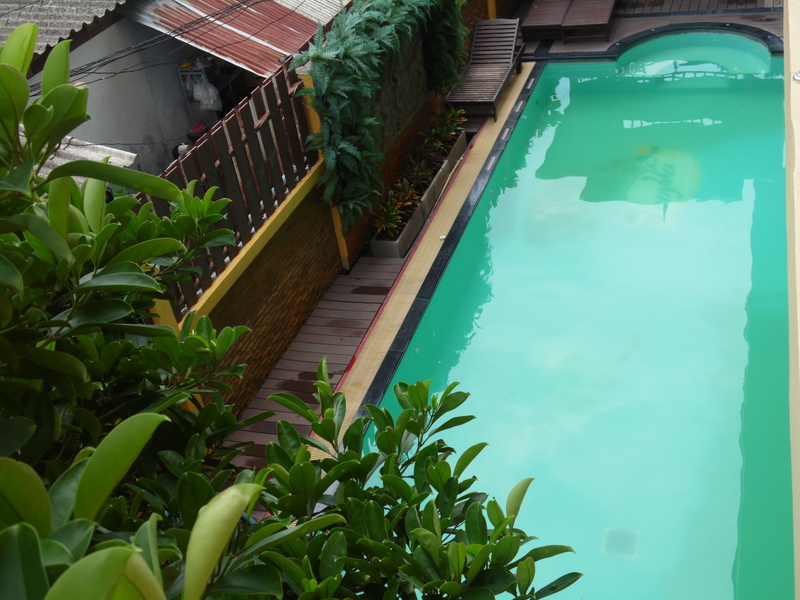 Our lovely swimming poo in Bangkok. Not too big, not too small, perfect for those first sticky, humid nights! At the beginning of the week, I mentioned that we spent our first day in Bangkok, just relaxing and walking around. I mean, we’ve just spent 13 hours in the air and spent another 4.5 hours in both the Berlin and Qatar airports, so I guess we were allowed to while away the time. People have so many opinions about Bangkok. Some people hate it. Whatever the case, you’re going to have an opinion. In fact, when I first (1st) visited Bangkok, back in 1999, I didn’t like Bangkok either. It was my first time to go to Asia, I was travelling solo, it was August, and it was hot. I hadn’t a clue what I was doing and where I was going. It was just dusty and hot, And I couldn’t read the writing as it was in Thai Sanscrit in those days, but I was fascinated because that was the first time I saw a “real” elephant roaming the streets and blocking up traffic! The last time I was in Asia, 7 long years ago! 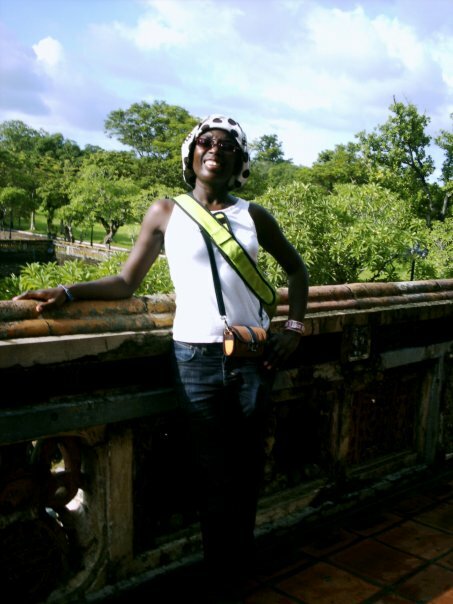 The second (2nd) time I went to Bangkok was in 2007, after almost a month in the Mekong valleys and jungles of Vietnam. This time I was intrigued to go to Bangkok. I loved it. We went to a few shows and had lots of sushi. The highlight of that trip was when a tuk-tuk driver took me to a go-go bar instead of the Thai dance performance venue that I had actually requested. It was only when a couple of men started fighting in front of a steel iron door, and I happened to be the only dressed woman around, that I thought to leg it out of there! 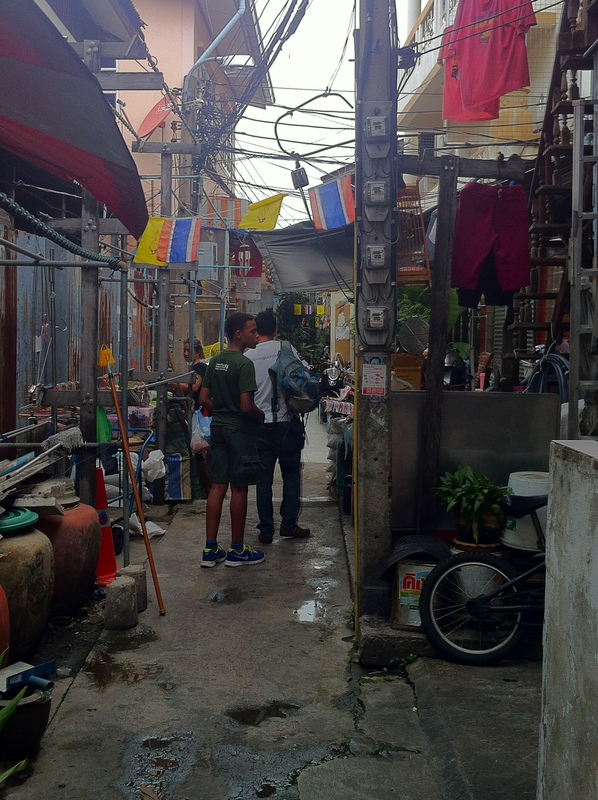 Walking through the backstreets of Bangkok. Seven (7) years later, I returned again. With family in tow. I wanted my family to have a fascinating first-time approach to Bangkok so I contacted a company called Bangkok Vanguards. 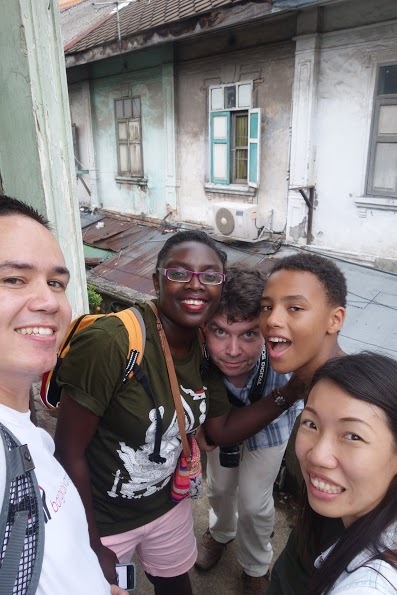 I found out about them from the post of Maria Wulff Hauglan a Norwegian blogger: Nerd Nomads. I saw her post and I thought, yes. This looks good. 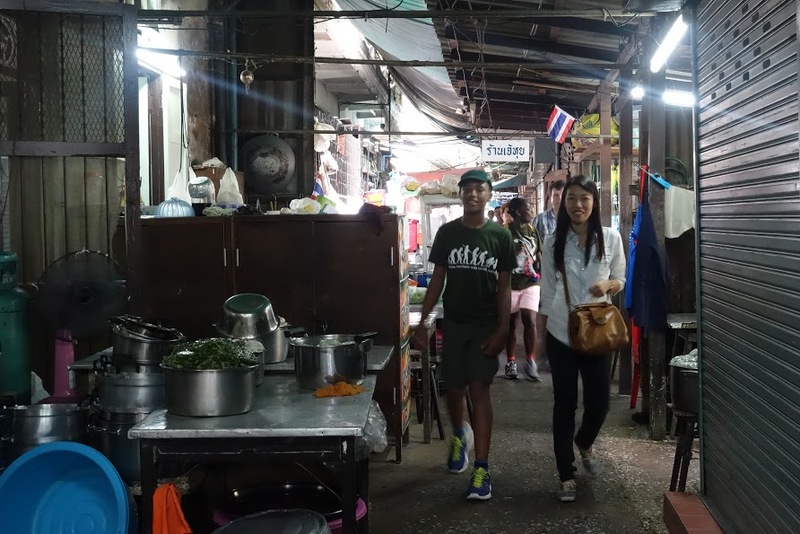 A guided walking tour, but a walking tour with a difference and not only that, but an owner who not only happens to be half-Thai, but he also happens to be half-German. A match made in heaven! You all know how I love walking tours. Remember, when I went to Scotland and took the Edinburgh walking tour, and then I went to London in January and went on a walking tour in London too. 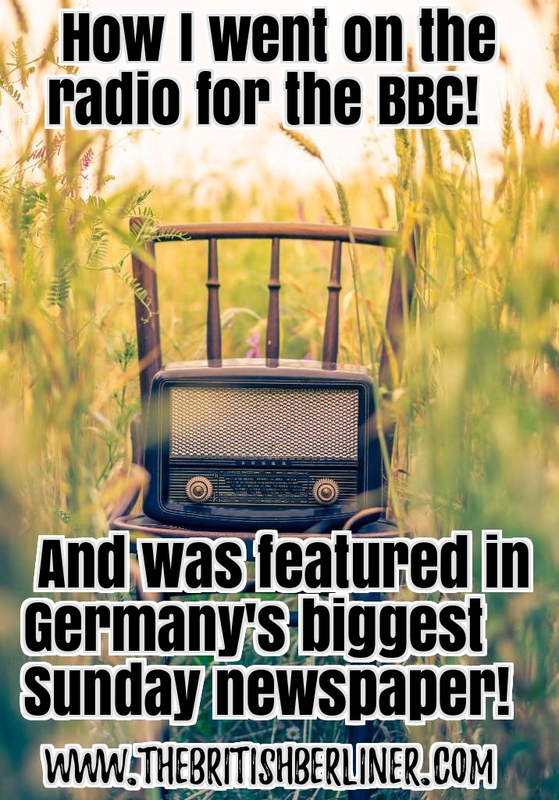 Do you know that even though I am The British Berliner and that I’ve lived in Berlin forever, I still felt it useful to go on an alternative walking tour in Berlin. So of course, I’m going to do the same in Bangkok. And Then We Were Four. 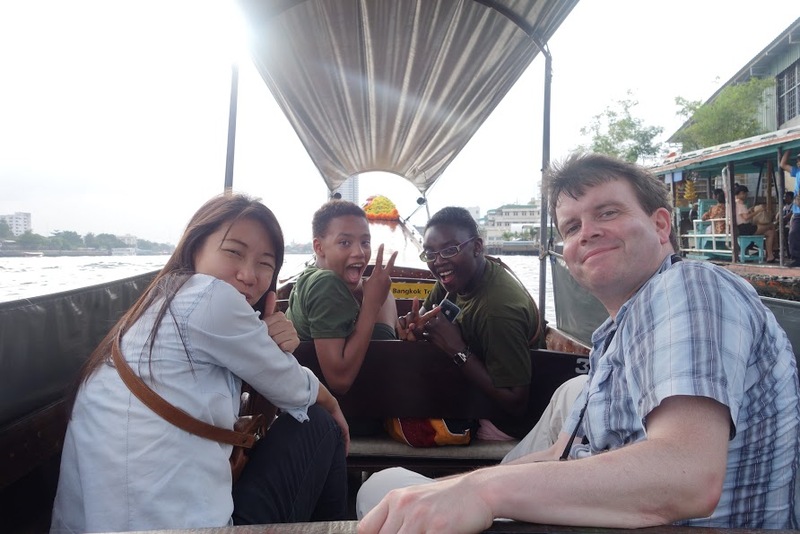 Make that Five: The Music Producer, “The Tall Young Gentleman,” Michael, Cherie, and myself as the photographer, On the river in Bangkok, Thailand. Anyway, I contacted the Managing Director of Bangkok Vanguards: Michael Biedassek, and he was really nice and friendly. He was so nice that I couldn’t believe it when the next day the person leading our walking tour was Michael himself, and his assistant Cherie! An honour indeed. Let me tell you, you haven’t seen Bangkok until you have seen Bangkok around the clock and in every corner of that most intriguing city. The tour that we went on was called: Bangkok Three Sixty. Some of the local people in Bangkok, Thailand. The Bangkok Three Sixty is a private tour so Michael and Cherie came to our hotel and picked us up, and since it was only The Music Producer, “The Small Young Gentleman,” and myself, the tour started immediately. This tour is a walking tour and so the walking started as soon as we set foot outside the hotel! Getting all excited inside a local river boat. We walked through our suburban neighbourhood and then took an express boat across the river. At first, we were a little nervous of walking literally through people’s front door but that was what the tour was about. 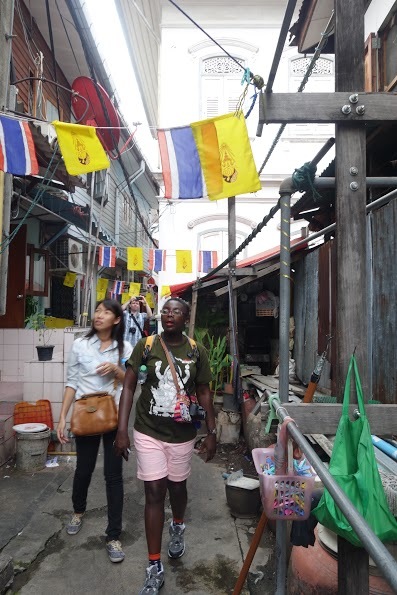 Getting your hands dirty and seeing Bangkok through the eyes and feet of locals. 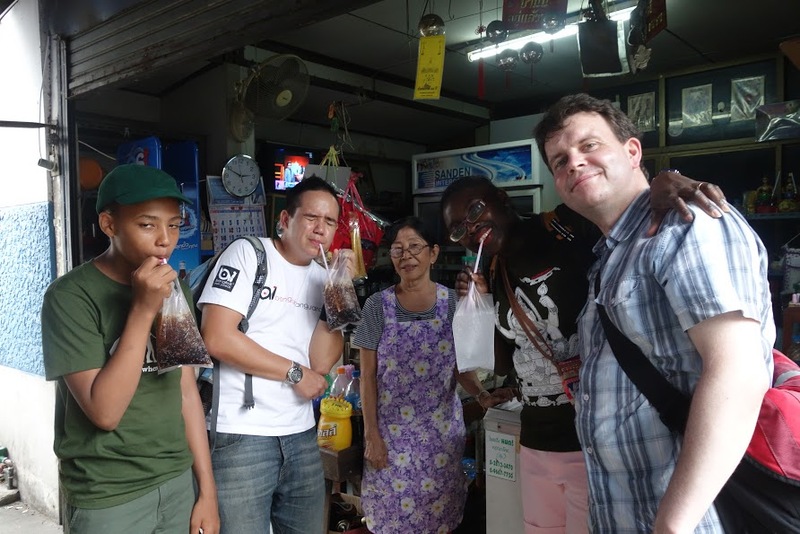 Once we gained some confidence, while Michael chatted to the residents, we smiled and attempted some basic Thai small-talk! Through the back streets of Chinatown in Bangkok, Thailand. I’ve been to Bangkok a few times but I’d never been to Chinatown. In fact, I hadn’t even been to that most famous of places, Khao San Road. Until the day before. A typcal Thai kitchen restaurant. And bought a couple of T-shirts that cost 170 Baht or $5.00 each! 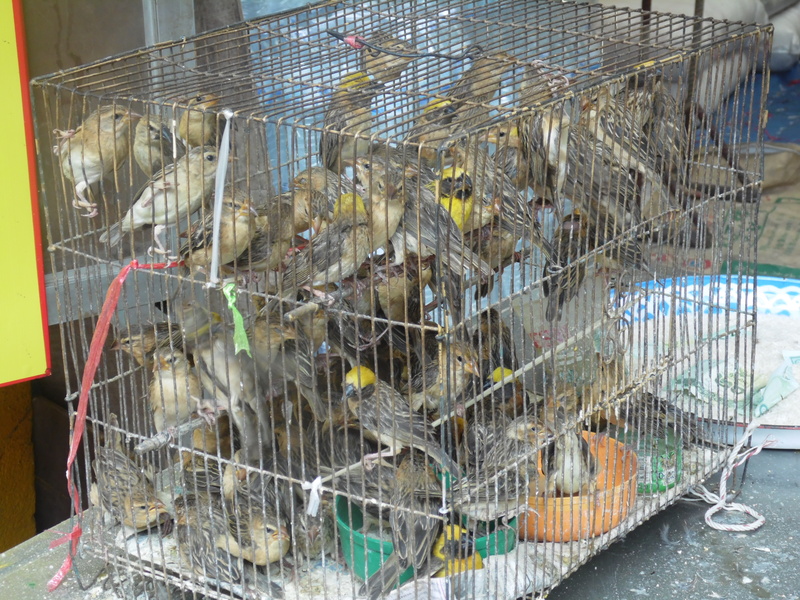 Birds in Chinatown, Bangkok, Thailand. I can’t remember why they were in the temple area. Does anyone have any idea? Chinatown was fascinating. We went to the temples. We saw the food that was distributed to the poor, needy, and religious. We got up close to monks and respectfully observed the drumming and chanting. We met an ex-Muay Thai boxer who showed “The Tall Young Gentleman” some of his boxing tricks, and also how his teeth could be knocked out whenever he wanted to! Our boy was delighted to see THAT trick! 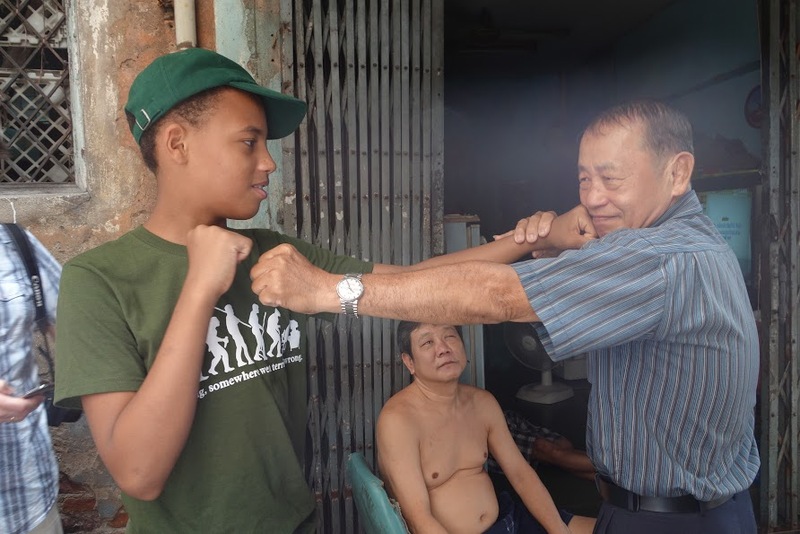 We met an ex-Muay Thai boxer who showed “The Tall Young Gentleman” some of his boxing tricks! 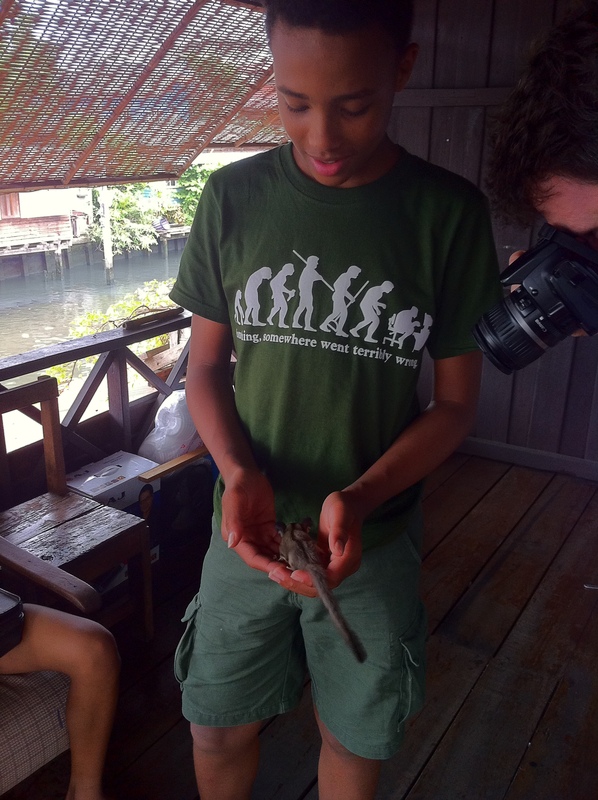 We went through the river community and stopped to see some sort of huge water-snake-lizard-thing in the river. It was so large, that I thought that they were crocodiles. There were two of them. 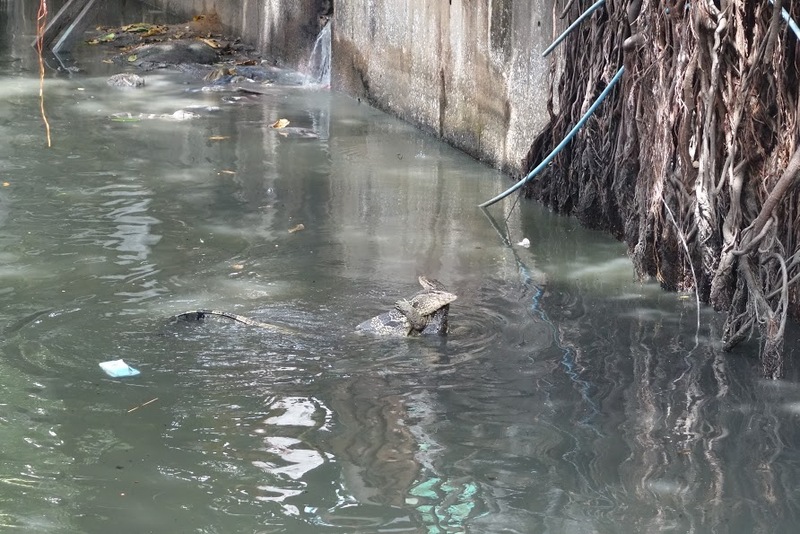 Two huge water-snake-lizard-things in the Bangkok river. We went to Indiatown. In fact I didn’t even know that was an Indian community at all. 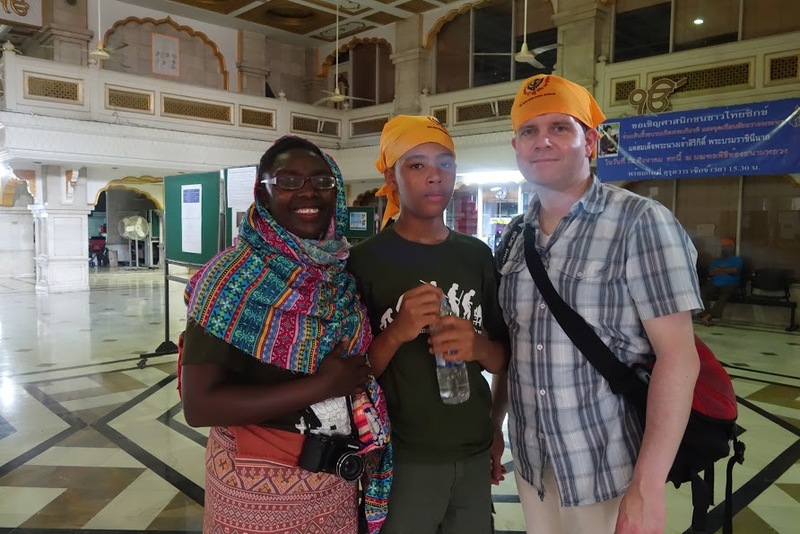 We decided to drop into a Sikh temple and we were enormously lucky to find a Sikh scholar who was willing to take us around the school and temple. Completely off the chart, as this wasn’t actually part of the tour, but you know what? That’s what it’s all about. Keeping it authentic, real, and Bangkok style! Myself, “The Music Producer”, and “The Tall Young Gentleman” donning bright yellow scarves and a colourful shawl at the Sikh temple in Bangkok, Thailand. It was so authentic that we all had to wear scarves on our heads, and that included the boys too! 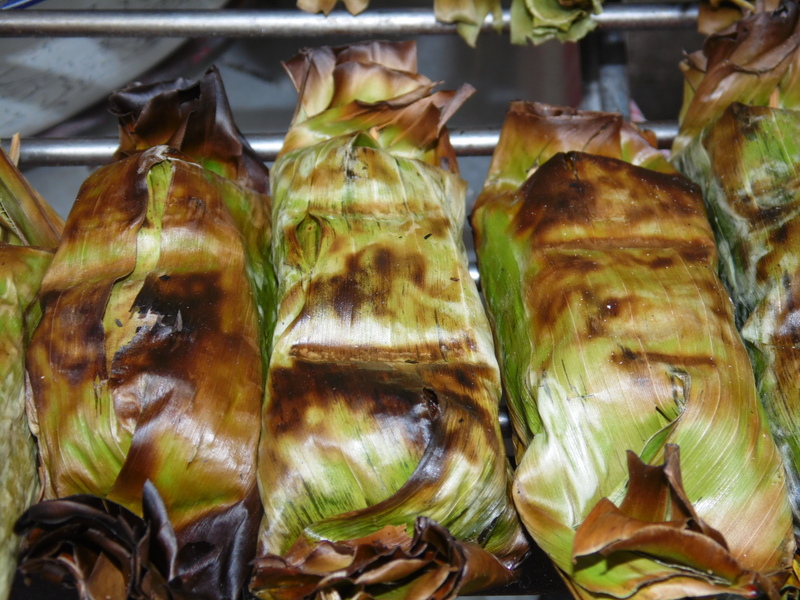 We went through the market where we saw and tasted exotic fruit, vegetables, and sticky rice wrapped in a banana leaf. Since we were still in Indiatown, we had our first taste of market street food: samosas that were spicy, sharp and enormously tasty. We also had lunch at a local Indian restaurant. Why not? We each made an order and then shared the food in the middle of the table. And then I went to the bathroom. And stayed there for some time. Quite a while in fact. The restaurant staff were worried. After 20 minutes, although it felt like 20 hours. I re-appeared slightly pale, but alive and well, and ready to sample more delights! 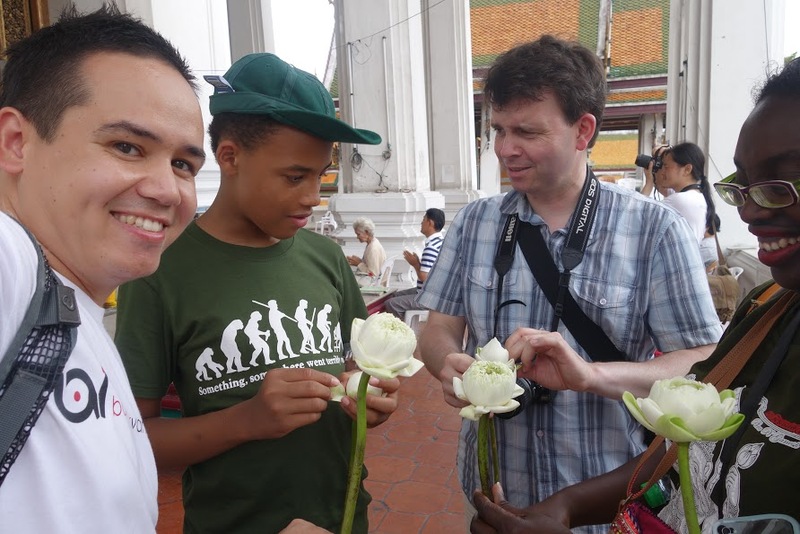 With those beautiful flowers at the Wat Suthat Temple. We visited the Wat Suthat, a first grade Buddhist monastery which contains the Buddist image, otherwise known as Phra Si Sakkayamuni. 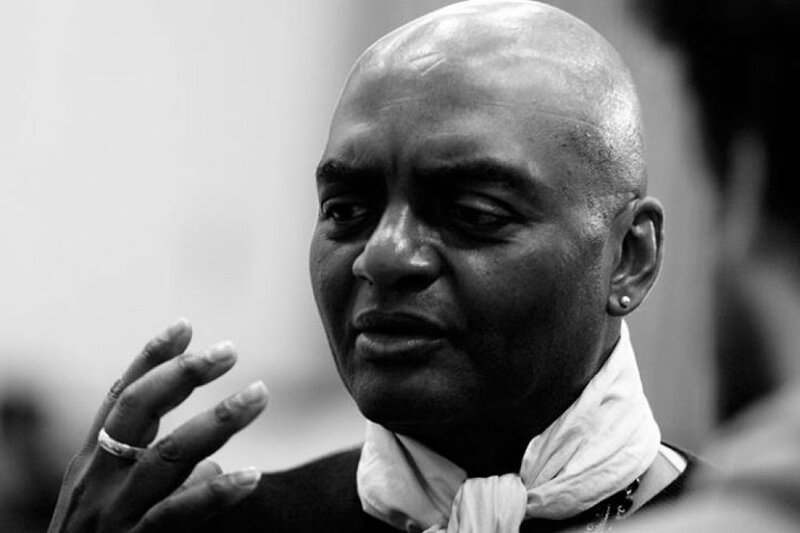 Michael showed us how Buddhists perform the ceremony of folding a flower, and lighting incense sticks and making a wish of desire. We also learnt how to sit in a temple (with feet tucked in or to the side), and how to observe the custom of not rising higher than senior citizens who were praying, but bowing and bending the knee, whilst walking past. Drinking through a plastic bag and a straw in Bangkok, Thailand. Our faces were scrunched up ‘cos the crushed ice was bloody freeeeezing cold! 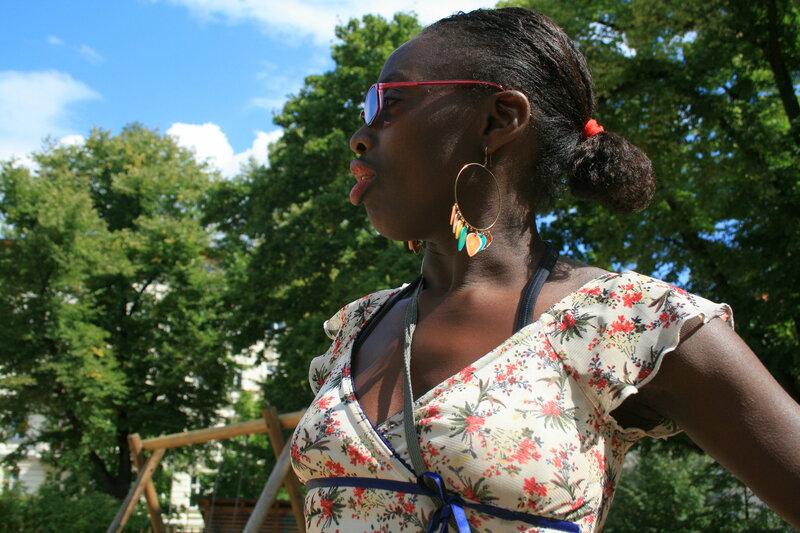 We went to the park and observed locals and expats working out. We went to other temples, we went through the back streets, and drank coca-cola and sprite through plastic bags and a straw. On a rickety bus in Bangkok! We squeezed all five (5) of us into the back seat of a tuk-tuk, and then jumped onto a local rickety bus. We basically had to leap into it, as the bus was surrounded by commuters going home or coming from work and the fact that you don’t know what you’re doing is not really an option, so off we went! 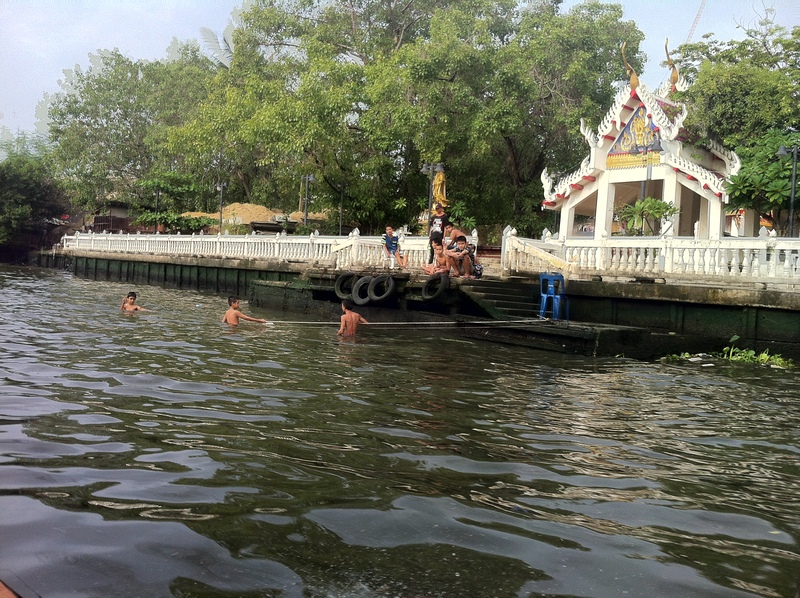 Fantastic views of everyday life on the riverbanks in Bangkok, Thailand. We had a Ruea Hang Yao or a long-tail boat, waiting for us. It was chartered specifically for us so that we could stretch out, relax, take as many photographs as we like, and er, sleep! Before we fell asleep on the gentle river in Bangkok, Thailand! I can’t help it if the combination of wind, sunshine, and the gentle swaying of the long-tail boat, eventually contributed to pretty much all of us taking thirty winks, along the way! By the way, our boat was fully equipped with safety equipment and life-vests, and our captain navigated extremely well. Children playing on the banks of the river in Bangkok, Thailand. On the river, we saw another part of Bangkok. A different world to the parts that we had preciously seen. And then we landed at The Artists’ House or Baan Silapin. 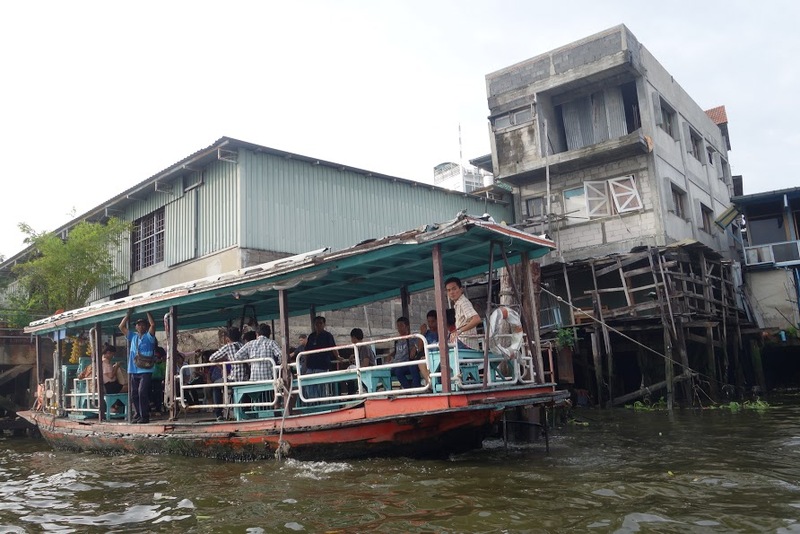 The Artist’s House is located on the old Chao Phraya River outlet which is also known as Bangkok Noi Canal or sometimes refered to as Klong Bangluang. At The Artist’s House on the banks of the river in Bangkok, Thailand. This place is amazing! It’s a row of traditional Thai wooden houses which have been restored to their former glory, and more than two hundred (200) years old. There are weird life-size statues of people dotted about. 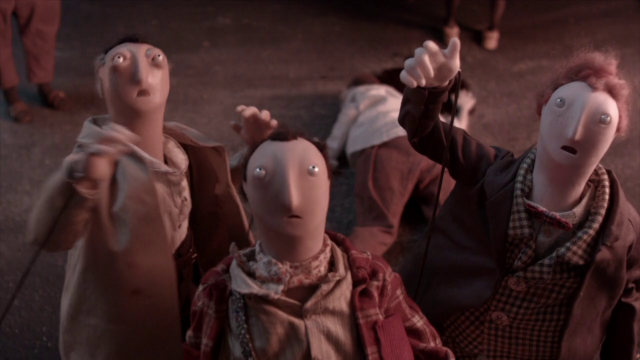 They’re so large and strangely located that I thought they were actually real people rather than objects! Local crafts shops, organic eateries, a temple, a puppet troupe, and some sort of Thai martial art school for local children. We met and chatted to some of the teenagers on the upper floor who seemed impressed by “The Tall Young Gentleman,” and the fact that he was only 12 years old. Some of the teenage girls got a little flirty. At the Artist’s House with a ferret-like creature in Bangkok, Thailand. They also had a ferret-like creature which they let him play with, and we let them hang out a little while we had cups of tea and bought some postcards, and hand-made writing paper. Eating together. Working together. Living together. In Bangkok, Thailand. We spent a little time here then we went back to town. Back into Chinatown where we were submerged into the market scene, and where people were cooking with huge pots of food on the street, and people were living from shoulder to shoulder, as close communities. Eating together. Working together. Living together. The gallery at the Chumbhot-Pantip Foundation in Bangkok, Thailand. 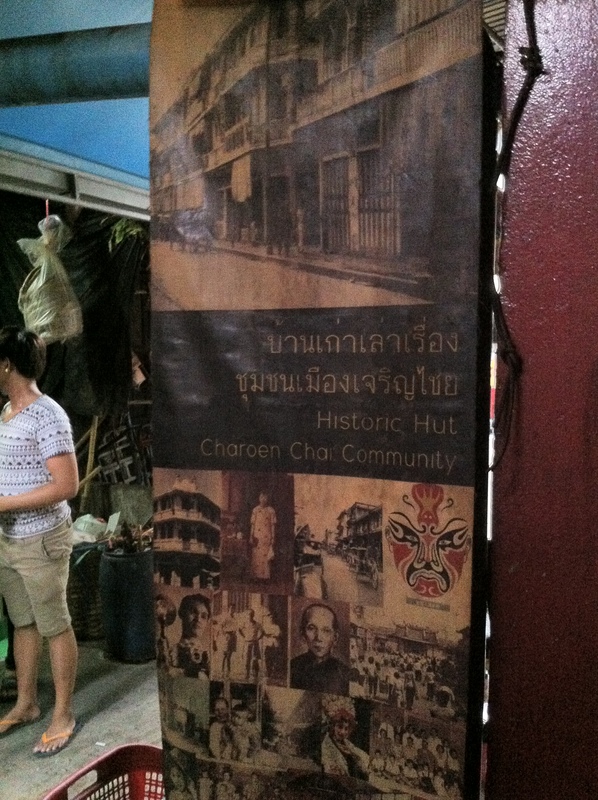 We then visited a local charity foundation in the heart of Chinatown called the Chumbhot-Pantip Foundation. They are a charity interested in preserving the history of the Chinese descended people in the area, the buildings, the culture, and language. The building was actually closed, but one of the locals ran around the neighbourhood and very nicely fetched the key, so that we could look around the gallery. Living history all around us in Bangkok, Thailand. Even though we visited the gallery quite frankly, the history of Chinatown was all around us, but perhaps not for long as history has taught us that some of these immigrant areas soon become prime estate. Bangkok is no different. Side by side the cooking pots and the children skipping on the streets, was an underground station being built. “The Music Producer” and Cherie, on one of the longtail boats! 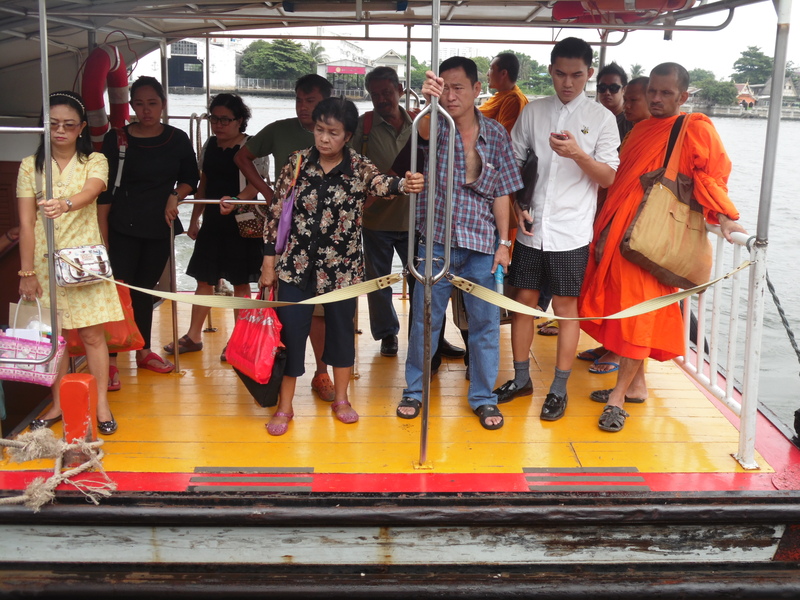 It was soon time for us to take a longtail boat again, but this time the commuter boat. It was about 17:00 and it was pretty crowded. The boat would come around and it would stop for about 10 seconds. 10 seconds in which you either jumped into the boat or you fell into the river. Michael was extremely attentive and held my hand so that we could leap into the boat together LOL! Once in the boat, the boat cover would go up so that you couldn’t fall into the river, and off they went. The conductors would collect the fares by standing and walking on the edge of the boat! The modern city of Bangkok, Thailand. 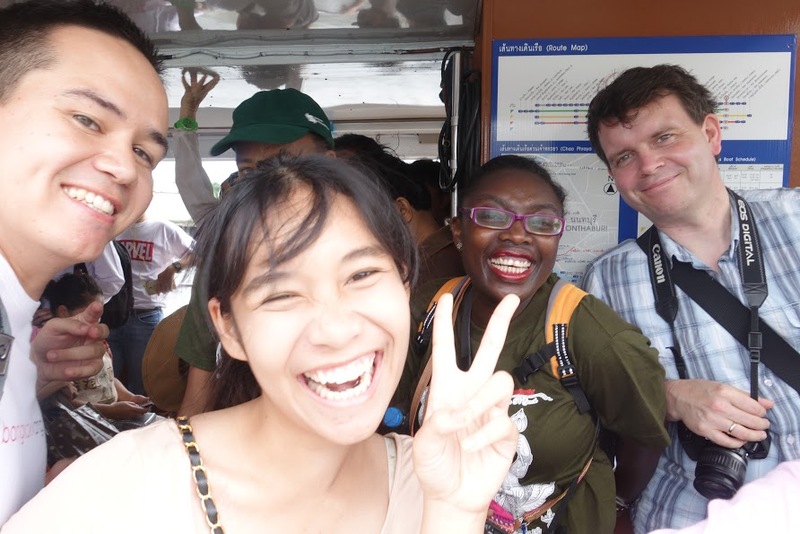 At 17:30, the Bangkok walking tour was officially over, but we were all having so much fun that Michael, the Managing Director decided to invite us to meet his girlfriend: Gift, and then a friendship began. We turned from clients to friends. He did call his lovely girlfriend and then we went into the center of the city and walked through the shopping district. My goodness. Bangkok is fantastically modern. I don’t know what it is. Is it some sort of elephant? But I want to take it hooooome! I couldn’t believe how clean and organised those shopping centres were. The bathrooms were amazing. With toilet paper. And ladies, there were at least 30 cubicles on EACH FLOOR so that you didn’t need to queue! And they were completely and utterly free of charge. Wow! I mean, even Germany can’t beat that. In Berlin, our shopping centres have about 8 cubicles AND you have to pay 50 cents for them too! In the shopping malls were Thai young people everywhere. There was even some concert going on, so we stayed, and watched for a while. 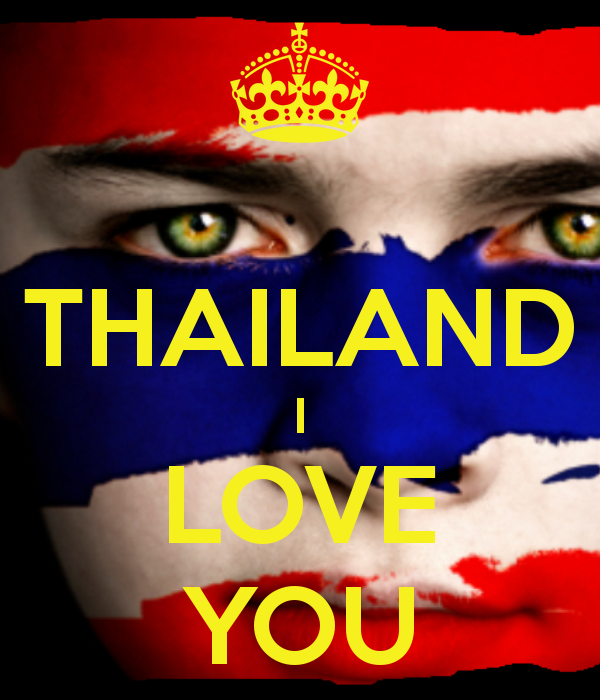 It was amazing and lovely to meet real Thai people. I hardly saw any foreigners. Isn’t that funny? Spicy chicken and pork in Bangkok for 80 cents a piece is an absolute bargain. And at a shopping mall too! Anyway, we hung around a little and went and had some snacks. In the shopping malls, you have food halls just as you have in Europe, and the food variety there was pretty huge, and most importantly, cheap. Yep! You heard me. 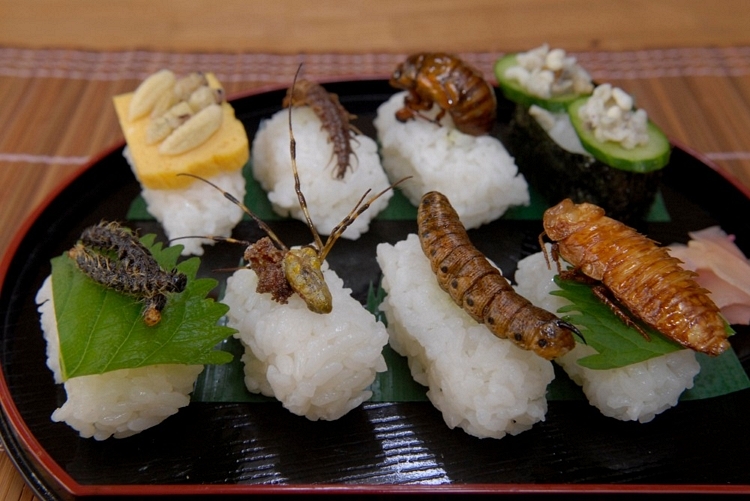 The food in the halls were cheap! 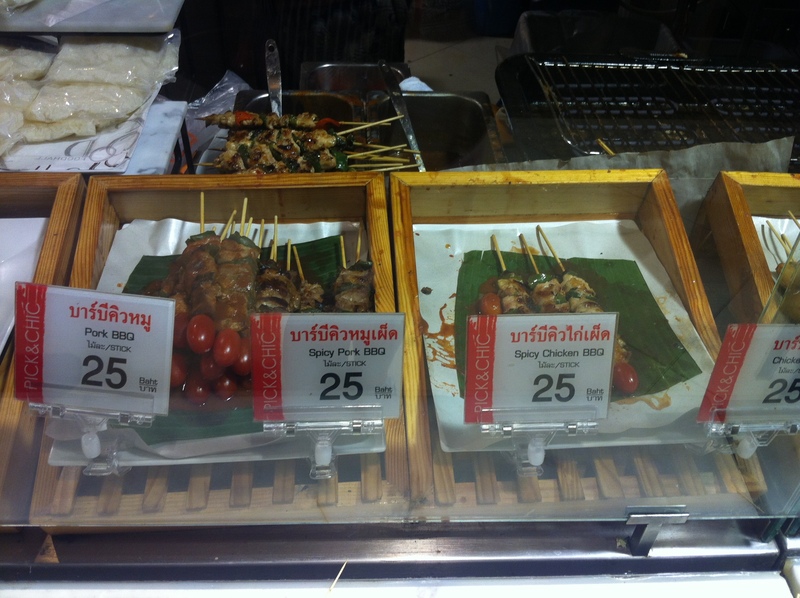 15 baht or 45 cents for a stick of grilled pork, 25 baht or 80 cents for spicy chicken, and lots of strange stuff. Michael also took us to a local restaurant frequented by students called Inter Restaurant. 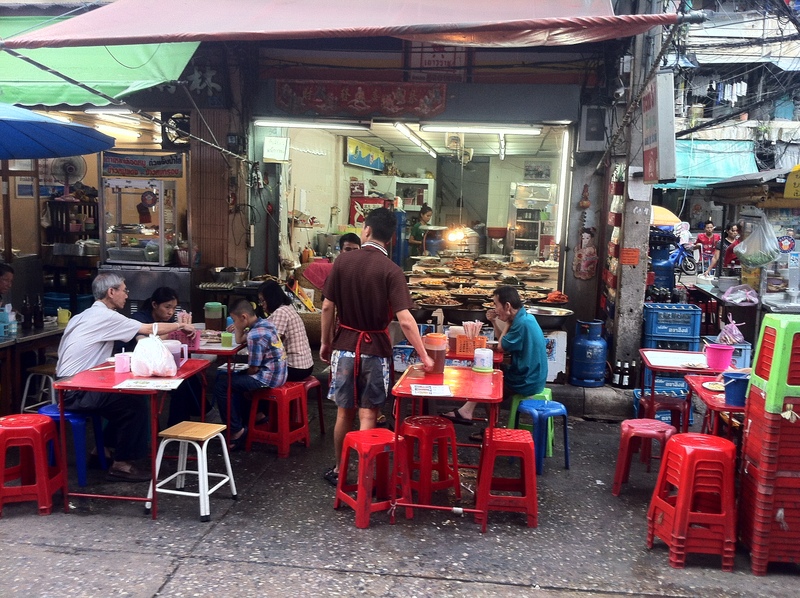 It’s in the Siam district area across from the shopping mall in Siam Square, and is fairly easy to find. 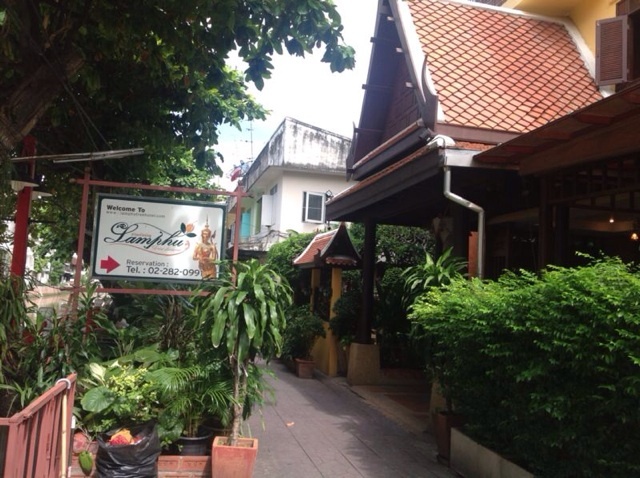 It serves authentic Thai food at prices ranging from 65 baht or $2.00 to 120 baht or $3.80. 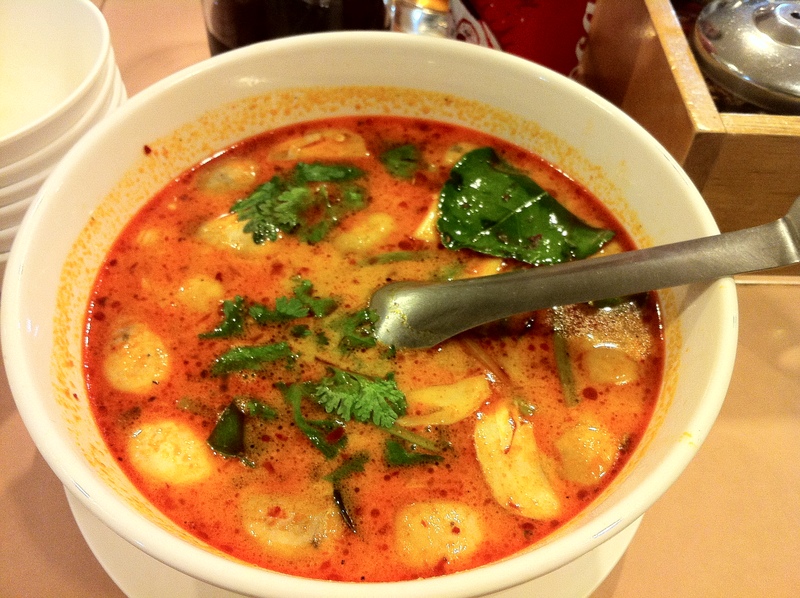 Delicious, yummy, spicy Tom Yum Goong soup in Bangkok, Thailand. We had a variety of meals which we shared together and even though we were stuffed to the brim, we didn’t reject the idea of going to a bar. 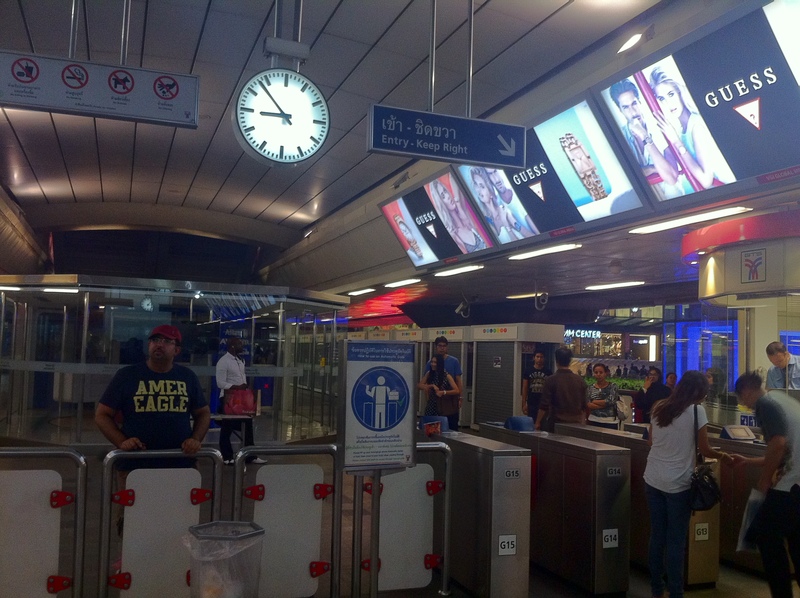 Using the Bangkok Sky Train. And so we took the Bangkok BTS Sky train. 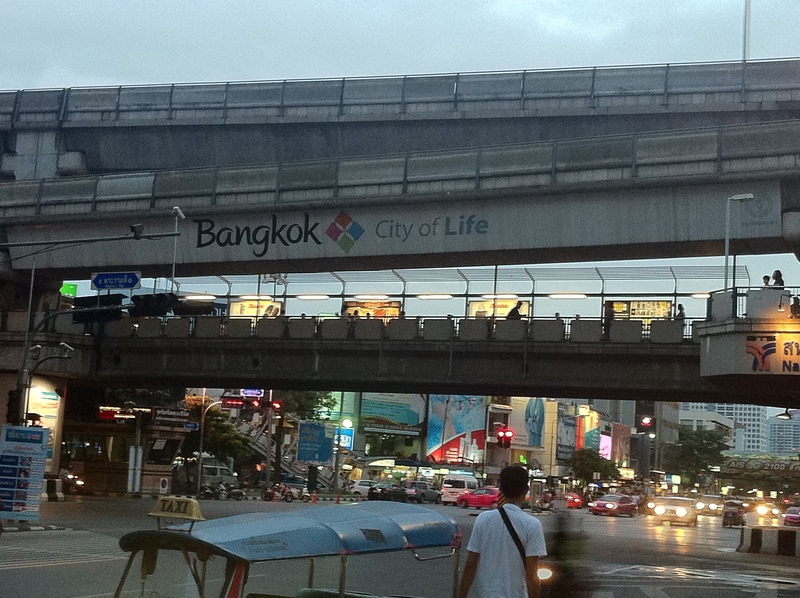 The BTS Sky Train runs through all the important downtown districts and major transport hubs in Bangkok. As it’s described, it zooms above Bangkok traffic at sky level and is connected at various places, in the city. Pretty neat. Inside the Bangkok Sky Train. 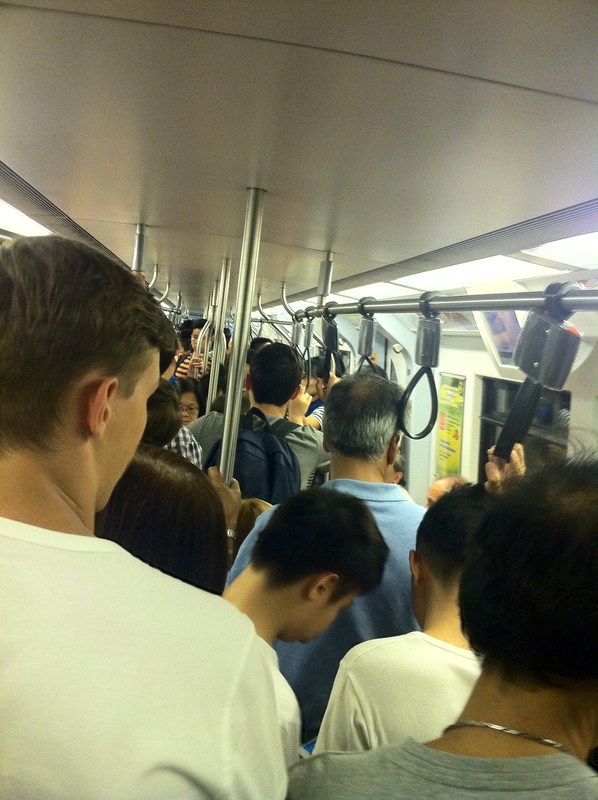 This was our first time to go on the Sky Train and again, it’s clean, organised and efficient. No problem at all. Tickets are fantastically cheap and once children are above 160 metres, age isn’t a factor, but height. In this case, “The Tall Young Gentleman” was a full-grown adult LOL! Single tickets are between 15-20 baht or 45 to 60 cents, and a one day pass would be 120 baht or $3.80. Cocktails at the rooftop bar of Cloud 47, Bangkok. As I said earlier, our last stop was a sky bar. In this case on the top floor of the United Center office tower, and is pretty chilled out. The sky bar was called: Cloud 47. There was no cover and you didn’t have to dress up. This was a godsend as we were still wearing our shorts and trainers, with bottles of water sticking out of our city backpacks. Not exactly the image you want to convey. 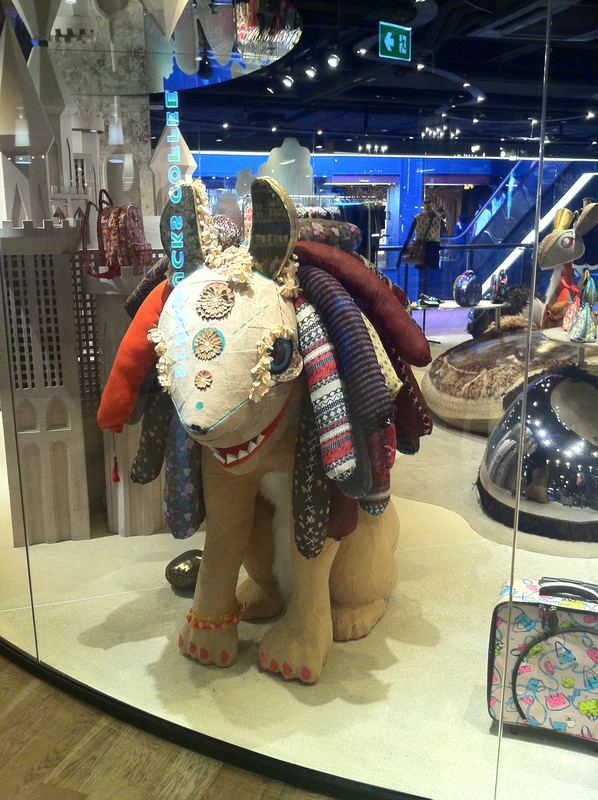 But the staff ignored our dusty outfits and were professional and friendly all the same. Phew! 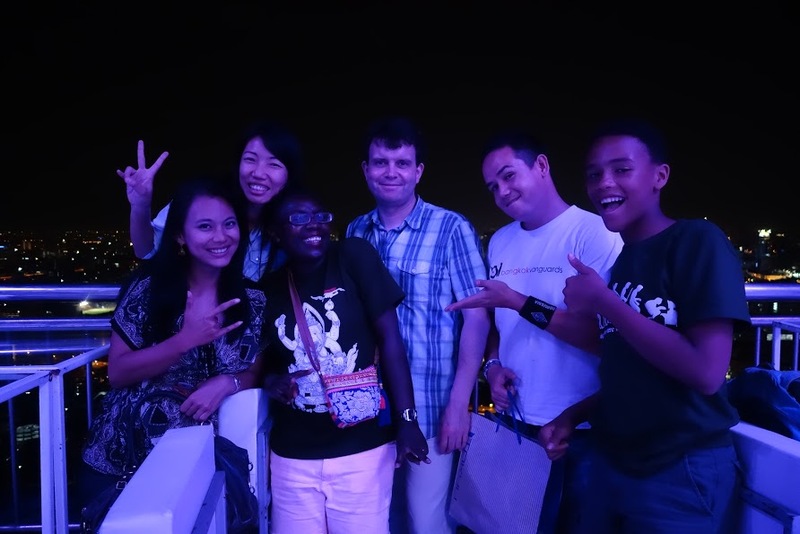 A happy time in Bangkok with the Bangkok Vanguards team! We had a couple of cocktails and the prices were reasonable. 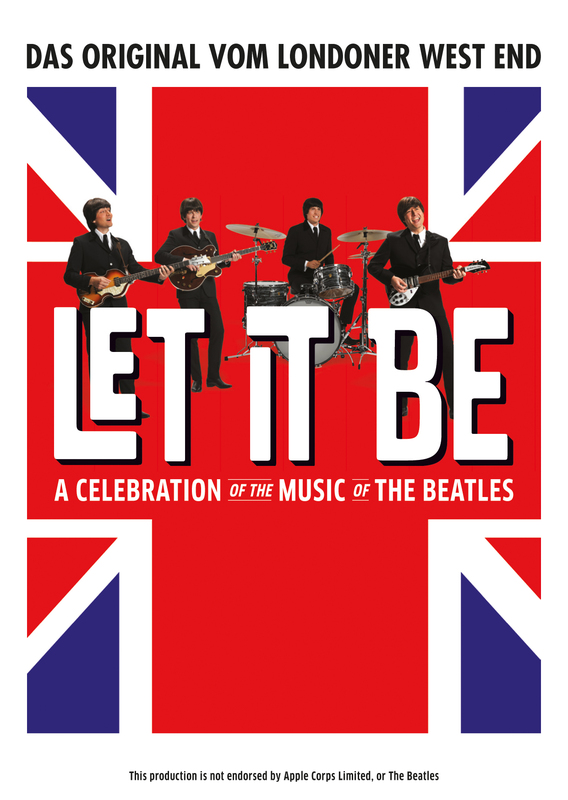 More Berlin than London! 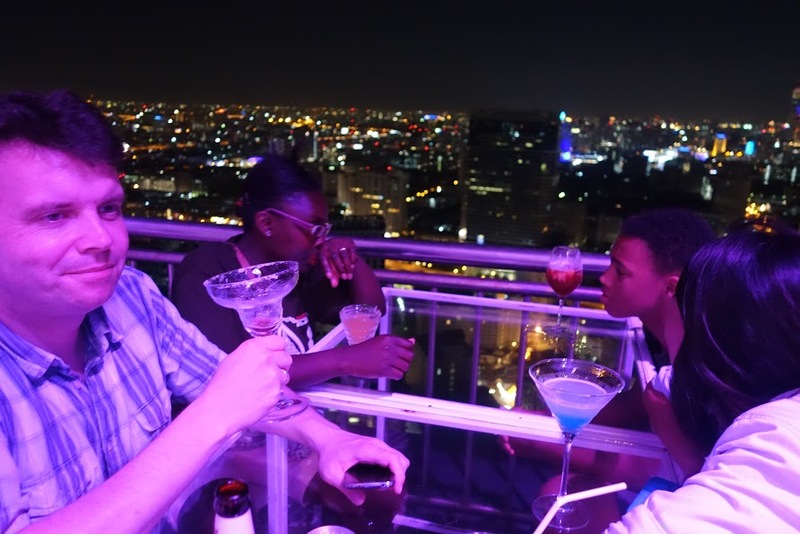 We took a lot of photos, clicked glasses, marvelled at the view, and sighed and reflected at the beauty of Bangkok. We had a marvellous day. In fact, we had been with Michael and his Bangkok Three-Sixty crew for 16.5 hours! They were great and really showed, and introduced us to the real Bangkok. We Five! Thanks so much Bangkok Vanguards. WHO ARE THE BANGKOK VANGUARDS? 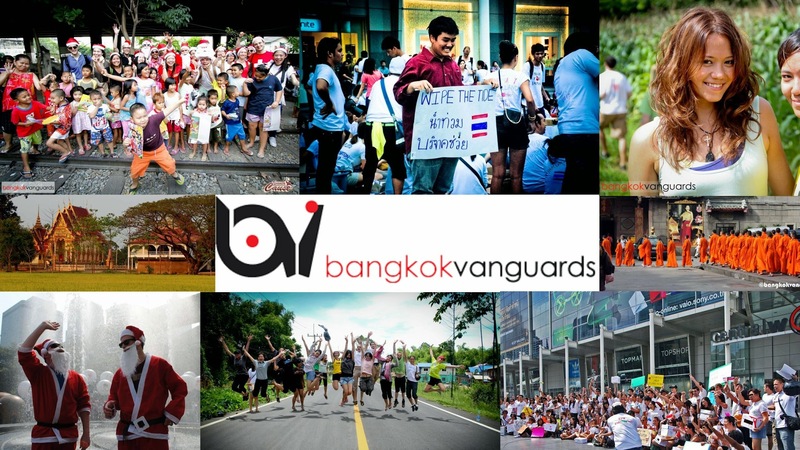 The Bangkok Vanguards are a dynamic team of die-hard Thailand fans who strive to connect people, through their passion for exploring the streets, cycling, conservation, street art, and education, about Thailand’s local, indigenous, communities. 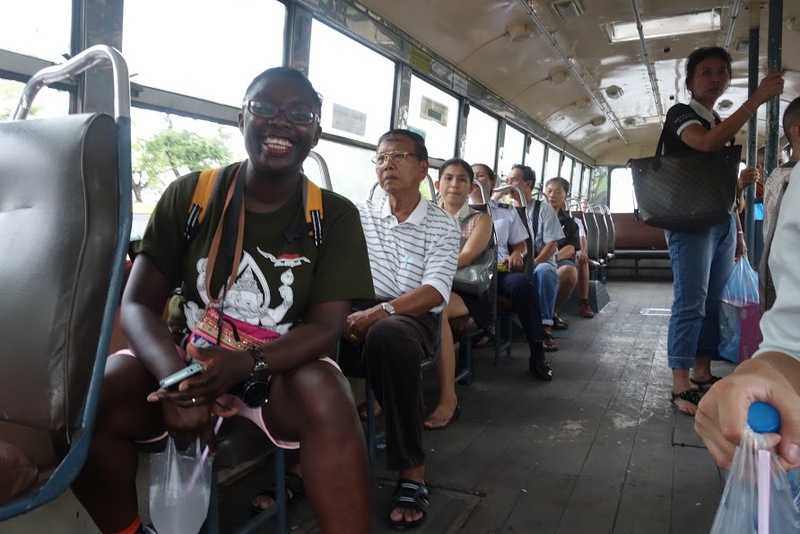 WHAT IS THE BANGKOK THREE-SIXTY WALKING TOUR ABOUT? The Bangkok Three-Sixty is about an intense, exciting, fun, alternative way of exploring the city of Bangkok, by moving away from the ordinary tourist trail, and travelling on a route that takes you on foot, and using all forms of available public transportation, to see Bangkok through the eyes of locals living there. DO I NEED TO UNDERSTAND THAI? These tours are available in either English, German, or Thai! A pair of comfortable shoes (no flip-flops due to the intense walk), cultural-sensitive clothes that reach to at least knee level and elbow length (as the walk is through the local community, in temples and personal homes), spare batteries, a pair of sunglasses, a hat, a huge bottle of water, a few basic words of Thai, and an enormous smile! 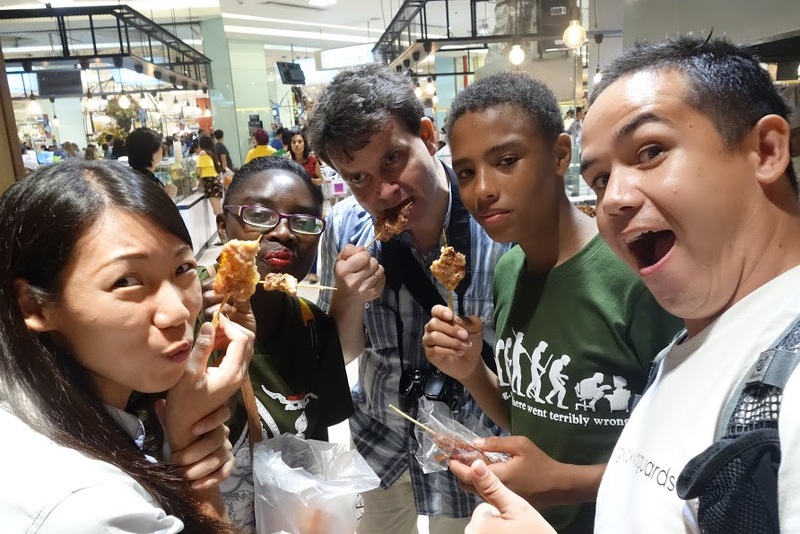 Laughing, smiling, and eating in Bangkok. Yes, this tour cost $90 or 2,950 Baht per person, for a PRIVATE tour, and was incredibly worth the price. This trip includes: The VEO (Vanguard Experience Officer or tour guide), a private boat tour, a wide range of transport that includes a local bus, a motorcycle taxi, a Khlong tour, an express bus, a tuk-tuk, a canal boat, breakfast, lunch, various snacks, support for Bangkok’s cultural heritage and art projects, and a pick up at your hotel. 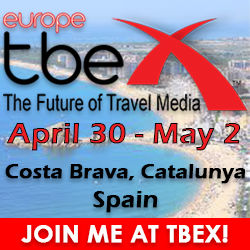 The trip excludes: Personal Insurance, happy hour drinks, personal expenses, and a tip for the guide. Approximate walking time: 9 hours. Meeting place: They will pick you up at your hotel if you’re staying within the Central Business District. Participants: Minimum 2, maximum 8. It is possible to have a private tour for one person but only after an enquiry. 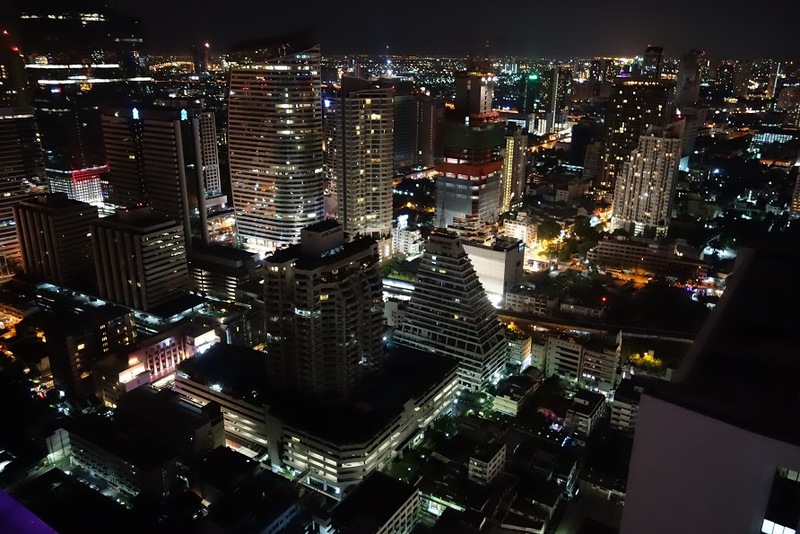 A breath-taking panoramic view of Bangkok at Night at Cloud 47 sky bar. The Bangkok Three-Sixty is a full-day tour so don’t make an important appointment immediately after. You might want to hang-out with the tour-guide and other members of your group, over a cocktail or two! 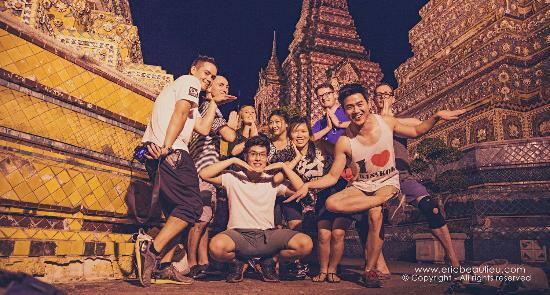 If you’re feeling particularly energetic, there’s a Bangkok by Night tour for 1,300 Baht (group) or 1,600 Baht (private), a cycling tour for 2,500 Baht (group), or 2,950 (private), a first-time in Bangkok highlight tour for 2,500 Baht (group) or 2,950 (private), and of course, you can also organise a customised tour to your own taste to be shorter or longer! The Beauty of Culture in Bangkok. The idea of a walking tour around a city is enormously appealing, and something that everyone should do. At least once. It also gives you confidence to move around on your own as you now know what to do, where to go, and how to get there. For more information about this walking tour, please contact: Bangkok Three-Sixty. 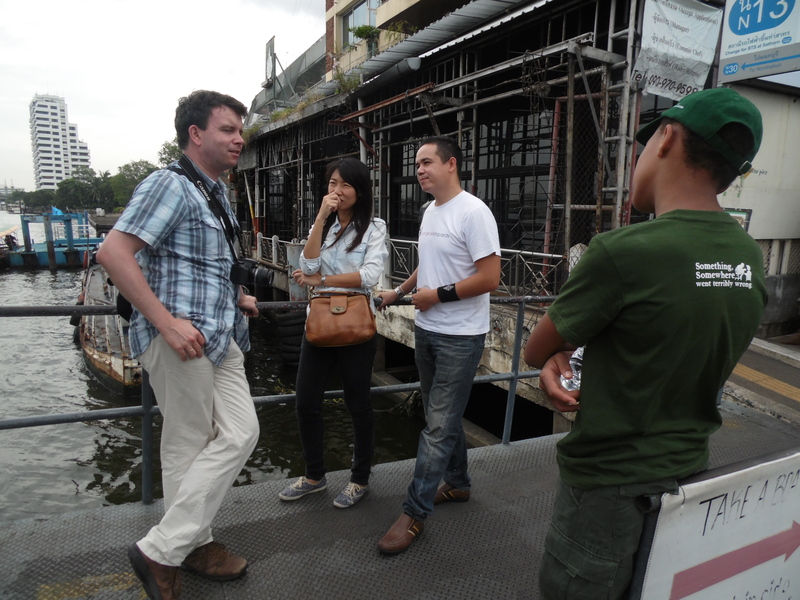 For more information about alternative ways of exploring Bangkok, please contact: Bangkok Vanguards. WHAT IF A WALKING TOUR ISN’T MY CUP OF TEA? 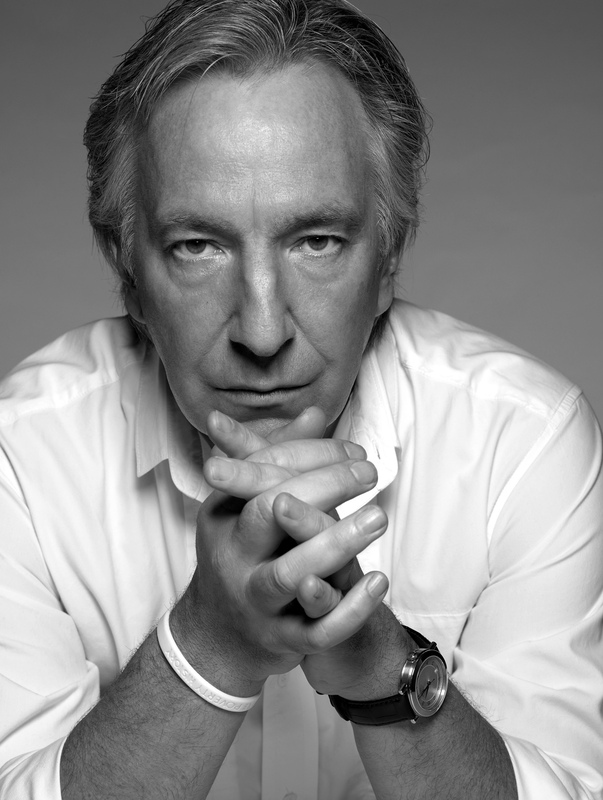 Keep reading my blog. There’s more to come! This article is not sponsored and even though I received a discount, all opinions and the delicious cocktails that I heartily quaffed, are my very own! I have so much to share with you so for the rest of August and the month of September only, I will be writing about our adventures in Thailand, Indonesia, and Qatar and at the same time, keeping you posted as to the fantastic things going on in my wonderful city of Berlin. 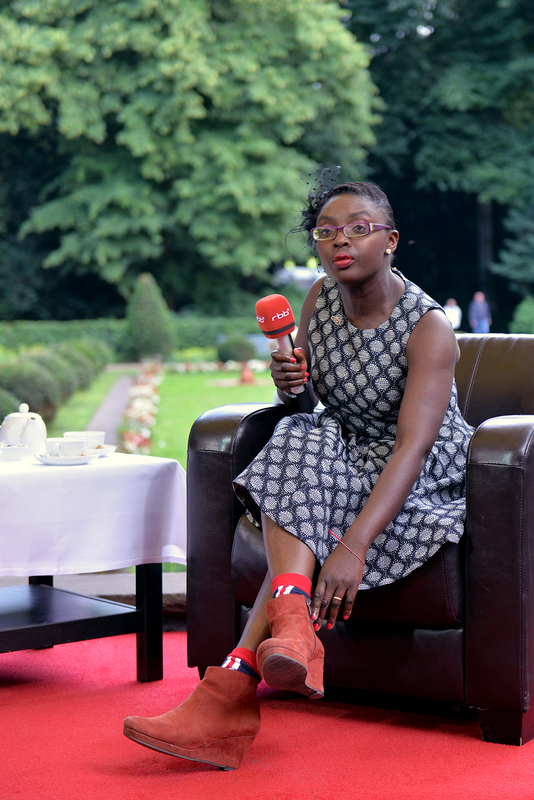 Berlin Music Week is going to take place from 03.09.14 – 07.09.14. Berlin is going to show it’s unique mix of music and technology, festivals and club events on a world stage, with two core events: the WORD! 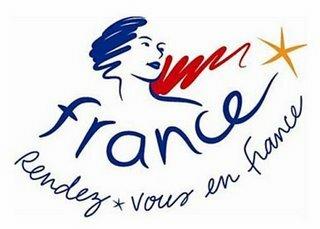 conference for business and SOUND! for live events. STRICTLY STAND UP – The English Comedy Night is going to take place on 10.09.14 at the Quatsch Comedy Club in Berlin. November 9th, 2014, marks the 25th anniversary of the Fall of the Berlin Wall. Events are taking place all over the city until then. September is going to be a beautiful month. Thanks very much Bangkok Vanguards. Have you been on a walking tour? Have you been on a tuk-tuk? 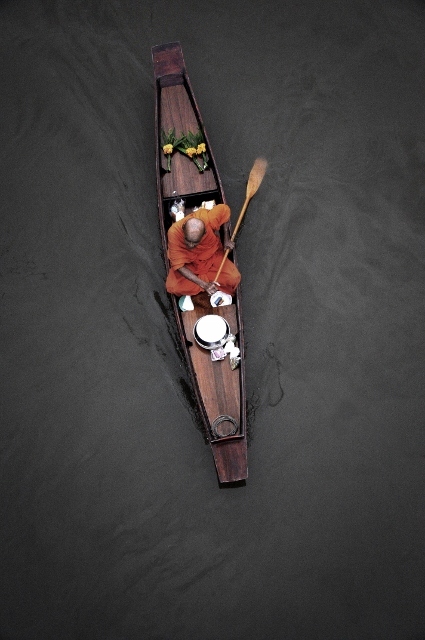 What are your top tips for visiting Bangkok? Previous PostHow to go to Bangkok on the superior cheap, and take the family with you!Next PostThai food is going to kill you: Eat it or die!